As I pointed out in my previous post, the evening of 19 September was reasonably clear (the odd streak of clouds every now and then). After I observed USA 129 (and incidentally Topex flashing nicely, see previous post), I set up the camera with the automated wire release for a long series of images on the celestial pole, using the EF 2.8/24mm wide angle lens. 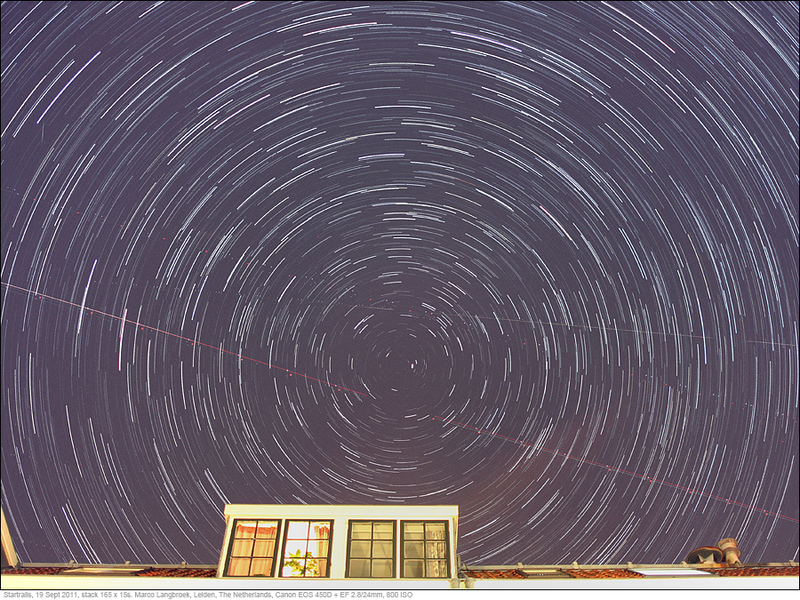 Result is above "classic" star trail image, showing the eternal circling of the sky around the celestial pole. It was constructed by stacking 165 images of 15 seconds each, shot over a time interval of 44 minutes. Note that the Polestar makes a small circle segment too - it is not exactly at the celestial pole. The long crossing lines are aircraft (I am close to a major airport). 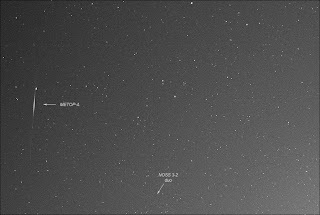 The near-vertical trail in the upper left corner is a satellite flare however: the European weather satellite METOP-A (06-044A). 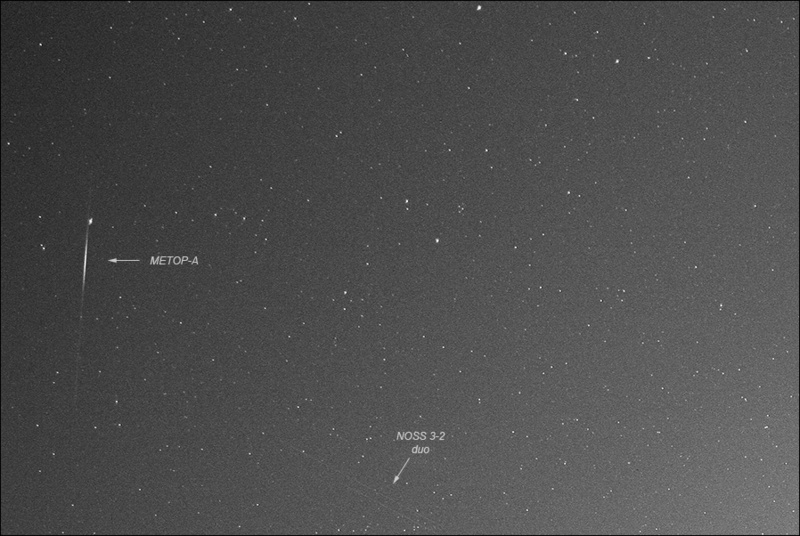 Below is a detail from the single image that showed the METOP-A flare (at about 20:37:55 UTC, 19 September). Very faintly, the double trail of a NOSS duo, NOSS 3-2 (03-054 A & C) can be seen as well. As this part of the image is close to the image edge, it suffers a bit from coma with this wide angle lens. 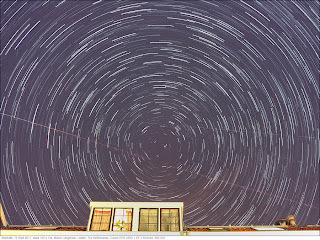 In the old days of analogue photography, a 44 minute star trail image like this would not have been possible from my urban locality: the image would have fogged too much. Modern digital and especially image stacking techniques, make it possible. Watch UARS - it's dropping! SPECTACULAR flare by IGS 1B!